Although consumers were warned several times this year that gift cards might not be the best option when buying something for their loved ones, some likely continued buying the plastic cards as gifts. If you found yourself on the receiving end of a not-so-wanted or needed gift card, you now have the option to trade it in for a Walmart gift card – and a couple of big catches. To participate in the program customers enter their gift card information online and once the card is verified they will receive a Walmart gift card in their email that can be used either in person at local stores or online at Walmart.com. The entire process can take anywhere from a few hours to an entire day. While the program seems fairly simple, there are several drawbacks. Customers hoping to trade in that $100 Starbucks gift card to buy $100 worth of things they actually need like groceries or diapers from Walmart, will quickly find that that’s impossible. Under Walmart’s exchange program customers can only receive up to 97% of the original card’s face value. And that fraction isn’t even guaranteed, as the trade-in value of cards fluctuates. Walmart isn’t revealing how it comes up with estimated values, Fortune reports. At the time this article was written, a $100 gift card to Starbucks was estimated to be exchanged for $72.45. The same amount from Target could be exchanged for $96.60, while $100 from Best Buy is worth $92.40 in Walmart’s exchange. While it might seem senseless to trade-in a gift card for less than it’s worth, consumers who covet diapers more than coffee may find it a fair trade-off. At least, those thinking of participating in the program will have the chance to view their estimates before pulling the trade-in trigger. The program has another potential deal breaker that already excludes a large chunk of would-be traders. Walmart’s trade-in program, which is managed online by third-party company CardCash, requires that consumers provide their credit card information before receiving a new gift card, KGUN-TV reports. Officials with CardCash tell KGUN that the information from the credit cards is only used to verify consumers’ billing address and to keep fraudulent users off the site. Although the cards won’t be charged, the mandate will likely push consumers concerned about their privacy and the use of such personal information away from participating in the program. Additionally, such a requirement eliminates millions of potential customers for Walmart. According to a survey by Bankrate.com earlier this year, about 35% of consumers over the age of 30 don’t have credit cards. For younger consumers, those ages 18 to 20, nearly 63% don’t have credit cards. 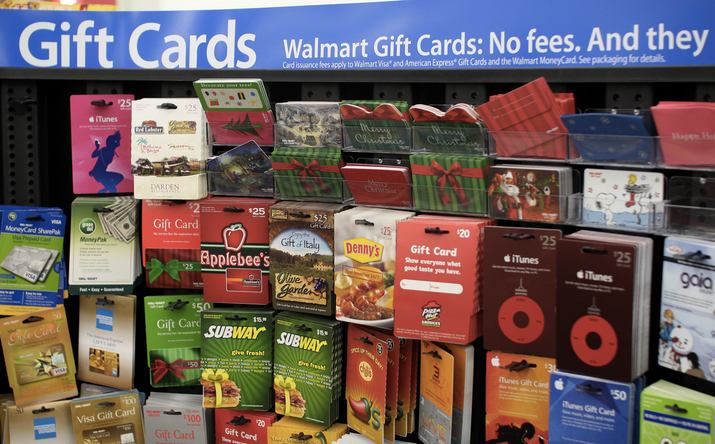 Walmart isn’t the first company to take advantage of consumers’ distaste for gift cards. Back in July, GameStop, which has been in tense competition with Walmart lately, announced it would allow consumers to trade-in unwanted gift cards for games from the store. A spokesperson for Walmart tells KGUN that the trade-in program is currently in its testing phase, but if consumers latch-on to the idea it could become a permanent fixture.